Cahokia Mounds State Historic Site visitors can climb Monks Mound, which has more than 150 steps. Assistant site manager Bill Iseminger stood at the base of 100-foot-high Monks Mound, bracing himself against an icy winter wind whipping across Cahokia Mounds State Historic Site in Collinsville. He was relating a story he’s told countless times: how the ancient Mississippians built the earthen mounds at Cahokia Mounds one basketful of dirt at a time. Iseminger, 74, has worked at the site for 48 years and figures he’s climbed Monks Mound at least 1,000 times, though not as frequently in recent years. Listen to supporters talk about what national park status would mean for Cahokia Mounds. Iseminger plans to retire at the end of the year, which is big news for volunteers and advocates of the site. No one knows more about the ancient mounds than Iseminger, who helped Cahokia Mounds transition from a recreational park to a world-recognized historic site. As he looks to the future, Iseminger believes the mounds will eventually become part of the National Park Service — an idea that supporters have recently revived. HeartLands Conservancy, which has led the effort, is working with local congressional representatives, including U.S. Rep. Mike Bost, R-Murphysboro, on new legislation to establish Cahokia Mounds as a national historical park, said Ed Weilbacher, vice president of the nonprofit based in Belleville. Two years ago, Weilbacher's group expected President Barack Obama to declare Cahokia Mounds a national monument. When that didn't happen, the organization was forced to regroup but didn't give up on the idea, Weilbacher said. Like other state-owned historic sites in Illinois, Cahokia Mounds has suffered in recent years from the state’s financial problems. Budget cuts five years ago forced the site to close two days a week. While the grounds are still open seven days a week, the site’s interpretive center is closed on Mondays and Tuesdays, even during the busy summer months. Last year, nearly 300,000 people from 80 countries visited Cahokia Mounds, said Lori Belknap, executive director of the Cahokia Mounds Museum Society, a nonprofit that operates the gift shop and raises money to support educational programs at the site. She believes attendance would be notably higher if the site opened on Mondays and Tuesdays, and that, in turn, would increase funds raised by the society. The 2,200-acre site protects 72 mounds built by the Mississippians 1,000 years ago. This was “America’s First City’’ — a hub of mounds where the ancients lived, worked and worshipped atop earthen structures, Iseminger said. The Mississippians built “satellite” mounds all across the region, stretching west across the Mississippi River. At its peak in 1200 A.D., an estimated 100,000 people lived at Cahokia. Joining the National Park Service would increase public awareness about Cahokia Mounds, Iseminger said. He still meets people in the St. Louis region who are surprised to learn about it. In 1982, the United Nations Educational, Scientific and Cultural Organization (UNESCO) recognized the cultural and archaeological significance of Cahokia Mounds and named it a World Heritage site. It is one of just 23 World Heritage sites in the United States and the only one in the Midwest. It is also a U.S. National Historic Landmark and is on the National Register of Historic Places. Most are established by an act of Congress, signed by the president into law. The president can invoke the Antiquities Act and designate areas as national monuments. While an executive order would have fast-tracked the process, Weilbacher said his group is now focused on the congressional route. A study published by HeartLands in 2014 concluded that a partnership between the National Park Service and the state of Illinois would be both beneficial and feasible. The plan’s collaborative approach is its strength, Weilbacher said. The model, which allows Illinois to retain ownership of the site, has garnered bipartisan backing from political leaders, along with support from residents, archaeologists and Native American groups. In May 2015, the Illinois General Assembly passed a joint resolution supporting national park status. In 2018, the Illinois Department of Natural Resources signed on to the national parks plan. The department took over the administration of Cahokia Mounds in 2017 after then-Gov. Bruce Rauner dissolved the Illinois Historic Preservation Agency that used to oversee the site. Weilbacher noted that President Donald Trump has taken steps to reduce the size and designations of some national parks, but he has also created two units since taking office. Last May, Congress created and funded Ste. Genevieve National Historical Park in Missouri. And in October, Trump signed an executive order granting national monument status to a Civil War site in Kentucky. Iseminger said he plans to volunteer at the site after he retires. “You know, I’ve worked longer than I had to, but my wife said I might as well be down here getting paid, because I would have been here anyway,’’ he said with a shrug. When Iseminger started working at Cahokia Mounds in 1971, Richard Nixon was president and the Gateway Arch was pre-school age. Iseminger had just graduated with a degree in archaeology from Southern Illinois University at Carbondale. He was hired to help develop the first small museum at the site and interpretive programs. Cahokia Mounds was then about one-fourth of its current size. The state created the park in 1925 after archaeologists determined that Monks Mound and surrounding mounds were not naturally occurring but had been created by an ancient civilization, Iseminger said. The park had campgrounds, ball diamonds and playground equipment. 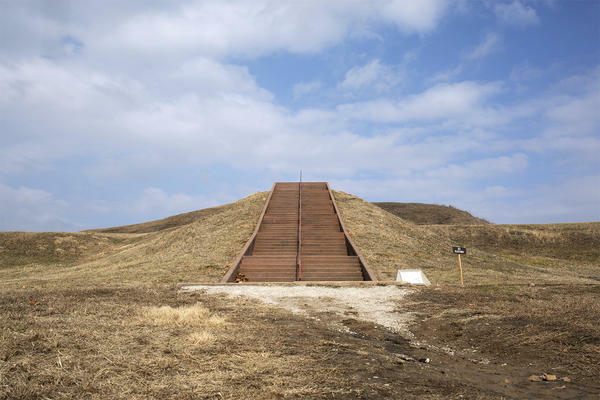 “People were running up and down the mounds and sledding down them in the winter,” he said. Iseminger has researched the Mississippians extensively and written books about the ancient civilization. After he learned to paint, he created an artistic representation of life at Cahokia Mounds that has been reproduced in publications around the world. National park status would give Cahokia Mounds a higher tourism profile, Belknap said. The site gets no state funds for marketing, so the museum society relies heavily on social media to spread the word. A few years ago, for example, volunteers turned to crowdfunding to raise $7,500 to print brochures. For now, Belknap is celebrating a smaller win: A $100,000 grant from the National Endowment for the Humanities to develop the prototype for an educational app. It would allow visitors to point their smartphones or cameras at the mounds and see virtual structures built by the Mississippians superimposed on the modern landscape. Belknap likened the app to Pokemon Go.